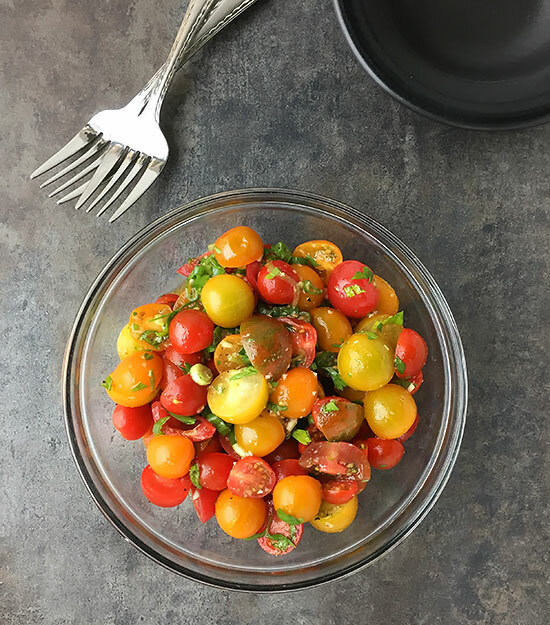 Simple and deliciously sweet, this Cherry Tomato Salad is sure to become a favorite at your family picnics or backyard barbecues! It’s marinated in a balsamic vinaigrette dressing with herbs and green onions. Cookout season is in full swing, and I know we could all use some good make-ahead dishes like this one. 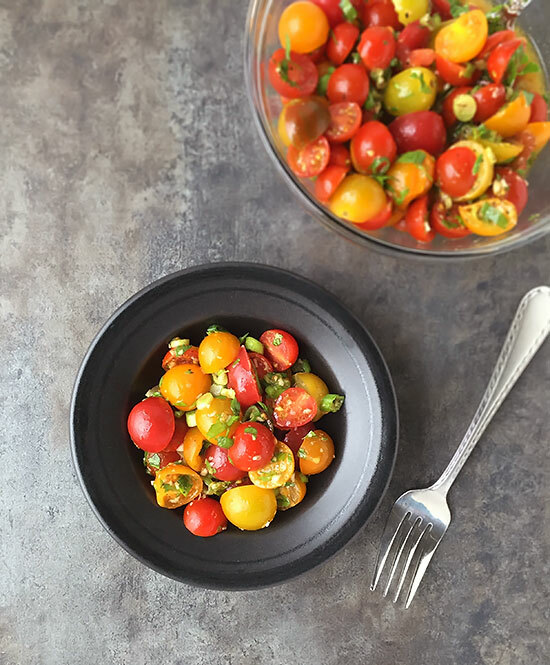 This Cherry Tomato Salad would make a terrific dish to serve at any of your backyard parties this Summer! Although you can find cherry tomatoes in grocery stores pretty much any time of year, Summer is when they’re at their best. Trader Joe’s had the most beautiful mixed medley of organic cherry tomatoes recently, and I just had to get some! I love coming up with new cherry tomato recipes. 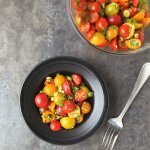 My Spicy Marinated Tomatoes are one of my absolute faves! This tomato salad can be served by itself, over a little romaine lettuce (the marinade becomes the dressing) or bruschetta. If you can’t find a mixed medley package, you could just use all red or buy an 8oz. package each of red and yellow. I just think the medley makes a prettier presentation. Easy to make and delicious, this Cherry Tomato Salad is a great make-ahead side dish! Add the tomatoes, green onions and parsley to a medium bowl. In a small bowl, whisk together the rest of the ingredients, add it to the tomato mixture, and gently toss to coat. Cover and place into fridge to let marinate for several hours or overnight.